...to recreate those hooked tools used with knitting looms. I am frequently lending or giving mine away and consequently am finding the need to replenish my stash, (particularly since I now have several kindergarteners interested in using my knitting looms). 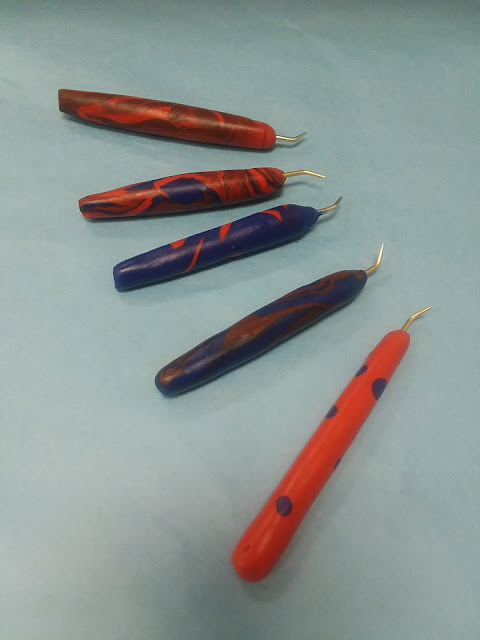 SO, I searched the net and did not find any simple ways to recreate these tools. I'm not saying that I invented this idea but I did not see it when I searched. 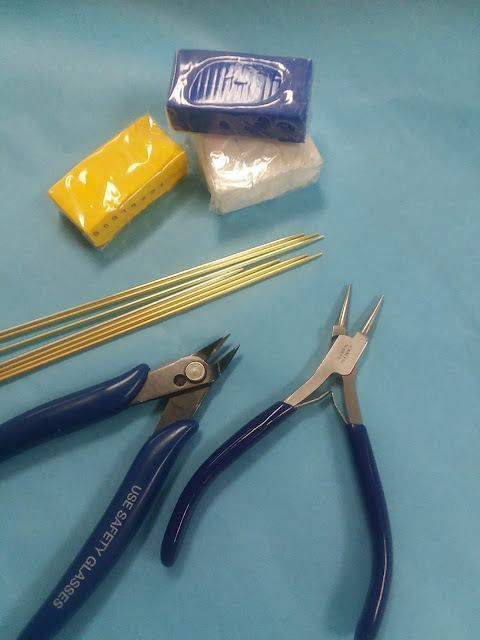 So for any like-minded folks out there here is my tutorial for hand-made knitting loom tools. 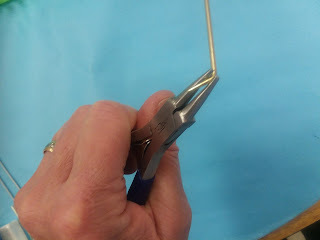 Using round jewelry pliers and working about 1/3" from point, bend needle in slight angle as shown below. Please check the location and angle of the bend to your personal preferences before making additional tools. 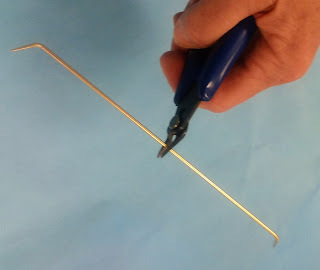 Aluminum needles do not hold up to a lot of bending and tweaking. Repeat bend to opposite end of needle. Each needle will yield TWO points which in turn will make two tools. Using (jewelry) pliers make slight bend in tip. Repeat for opposite side. 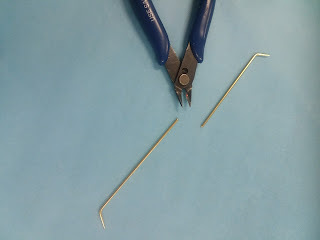 Using wire cutters carefully cut the needle in half, (don't forget to wear eye protection here). Two points ready to become two tools. Next make the handle. Here's where you can get very creative and really customize your handle to grip, color preferences and the like. Working with room temperature clay, roll out a rough tube shape about 4-6" long. Press the point into the clay parallel with the clay tube with the point sticking about 1/2" above what will be the top end of the clay handle. If this is clear as mud please see my finished pictures as follows. Sorry but I didn't take any "in progress" clay photos. Make sure to smooth the clay by carefully rolling on flat surface with the palm of your hand. Warning: Sculpey can stain clothes and wood and other things. Protect your working surface with waxed paper. Bake your Sculpey in oven on low, as directed on the package, paying careful attention to warnings regarding ventilation and so on. After the tool cools, place a small amount of E-6000 cement glue around the edge of the tool, where the point and the clay meet to prevent it from rotating in it's handle when in use. 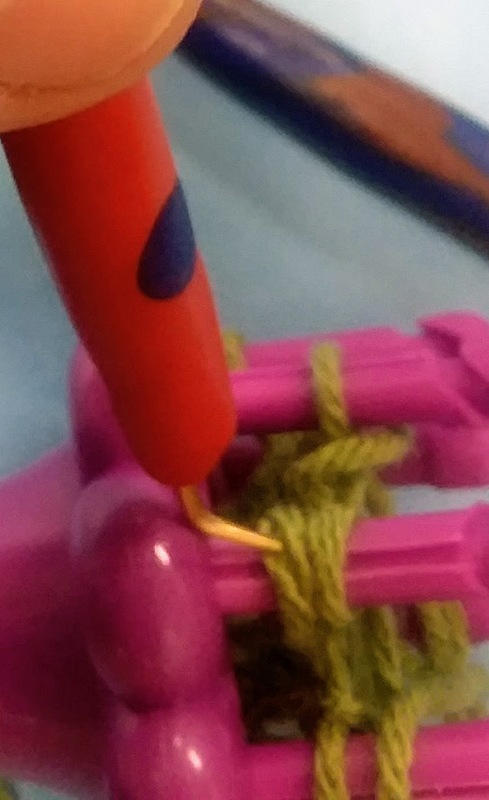 Finally, rub handle with olive oil, wiping off excess, grab your loom and some yarn and start loom knitting. Hope this tutorial helps. I am working on a handmade spool loom and will share as soon as I have a workable prototype. Until then happy crafting!! Last fall my pal Jennifer over at Desert Garden Farms created a CSA share just for our classroom. Rather than the large whole and half shares she prepared a quarter share for us, which was just enough to share with 24 kindergarteners. When we first bought the share she sent the class a sheep cutout mounted on foam board, (a la Flat Stanley), along with a personal note from one of the sheep and some very interesting specimens including a cotton boll, silk cocoon and other things of interest for the class. Much to the excitement of the class, we received the box of fluff several weeks ago. I purchased raw wool fiber so it had to be washed but even in it's raw state the fiber proved to be lustrous. I have my eye on the long brown strands of softness from her Shetland/Icelandic cross by the name of "Blackjack". It's very nice!! At any rate, because it was un-washed I didn't let the children handle the fiber until it was washed just to be safe. As a purchaser of CSA shares, we were given the unique and wonderful opportunity to name one of her spring 2016 lambs!! OK, so who was more excited about this; me or the children?? What an honor. We brainstormed names, allowing the children to do all of the nominations. Then time for a secret, head down/eyes closed vote. And the winner was "Jake Minnow". Jake, because it's a good boy name, (since our lamb is a ram) and "Minnow", because we ARE the minnows and now we have an honorary sheep minnow. How cool is THAT?? This is something the children may never get to experience again. Ever since I purchased the CSA share I have been pondering what to DO with it. 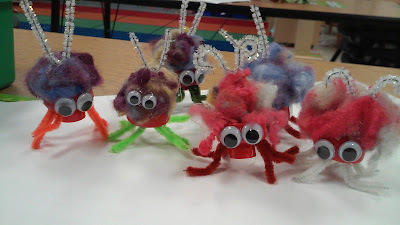 What kind of craft can we make out of the wool? How can I give each children his or her fair share of the share? Then it hit me....I will make each child a fiber cupcake to do with as he or she pleases, because in kindergarten we are always excited about cupcakes. DGF dyed roving or batts for "icing"
Wash/Clean and comb to fluff out fibers. Roll fiber gently in palm of hand, felting it slightly. Fill cupcake liner with the "cake" fiber. Ice the cupcake; pull about 3-4" of fiber from roving or batt. 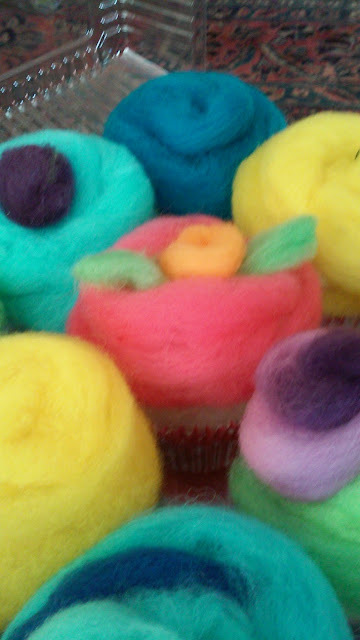 Lay across the top of the "cupcake" in a circular direction and lightly needle felt in place. Use small amount of red to roll in a ball for the "cherry on the top". Embellish with sequins small flowers, etc. Place cupcakes in cupcake container for extra realism. 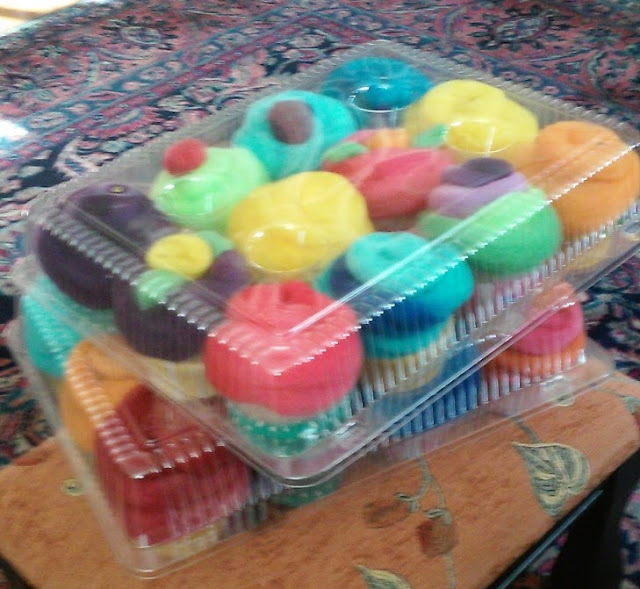 The children are amazed by these non-edible cupcakes. They are colorful, fluffy FUN! Barbed Biased Blanket - my first published design!! Hey Mom, what's for supper?? ?